Elana Meyer’s Endurocad high performance sports academy has helped produce 10 Olympic marathon qualifiers; read and be inspired! 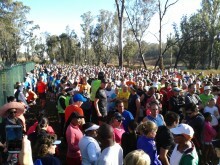 Get ready for the 702 Walk the Talk with parkrun! With less than a month to go before the Discovery 702 Walk the Talk event, Discovery invites you to take part in the weekly parkruns hosted at various parkrun venues around Gauteng to help you combine fun and fitness in preparing for Walk the Talk. The Discovery 702 Walk the Talk is taking place on Sunday 27 July at the Marks Park Sports Ground. parkrun in South Africa has reached world record participation numbers after 1 803 runners took part in the Modderfontein Reserve parkrun this past Saturday as part of World Move for Health Day. Parkrun and Discovery Vitality invite all runners and walkers to celebrate World Move for Health Day this Saturday 10 May, 2014. Parkrun and Discovery Vitality will be celebrating the day with a special edition parkrun at Modderfontein Reserve. 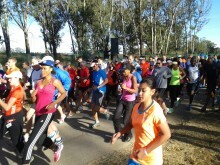 The run starts at 8am and all runners and walkers are encouraged to wear orange, the colour of Vitality to this event.